This chapter contains some of our main results. It largely follows the presentation in . 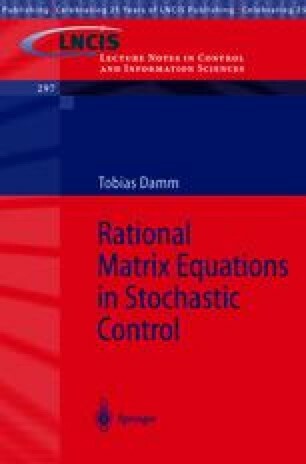 Our object is to tackle rational matrix equations of the form (2.27), derived in Chapter 2, which we view, very generally, as nonlinear operator equations in an ordered vector space. A standard method to solve nonlinear equations is the Newton iteration. Its applicability to operator equations in normed spaces was first established by Kantorovich in . In the operator-theoretic setup the method is therefore often referred to as the Newton-Kantorovich procedure. Kantorovich specified boundedness conditions on the first and second Fréchet derivatives of the nonlinear operator, which guarantee convergence of the Newton iteration starting in a small neighbourhood of the actual solution. These results can be simplified and generalized, if the underlying space is ordered and the sequence produced by the iteration can be shown to be monotonic and bounded; this can be the case, for instance, if the nonlinear operator satisfies certain convexity conditions (compare  and references therein).